I love the meal plans, thanks for sharing! These quiche are perfect for breakfast or even a snack. I absolutely use these plans! I dont follow them all the time, but I am sitting here getting ready to put this weeks plan into my mealplanner. My daughter and I just found your site – its AMAZING! I have Celiac disease, diagnosed two years ago and it is so hard to make recipes for everyone. I was wondering if you have or would ever do a GF Meal list. That would be wonderful! I can alter a bit if necessary. I haven’t Cathy sorry! I will consider for the future though. Make sure you check out the recipes under the GF tab! As someone that has been trying to be healthy and loose weight, I would like to thank you for your recipes and weekly meal plans! They really help out!!!! I’ve been struggling with my weight since stopping WW and was very seriously considering doing one of those extreme diets that eliminates several foods and relies on shakes for meals. Thank you for reminding me that sustainable weight loss is about balance and Real Food! Your meal plan looks heavenly and I think I groaned at the sight of those garlic knots and soup. Thank you for all of your hard work!! 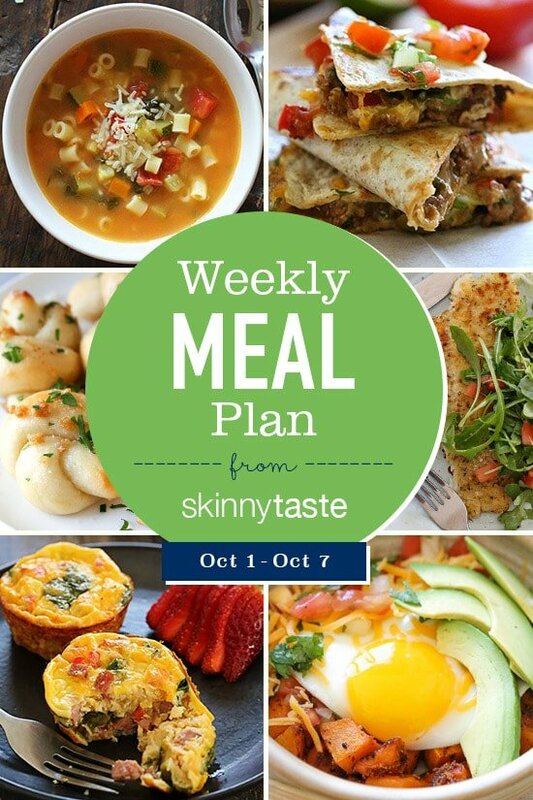 Thank you so much for sharing these meal plans – they are so helpful! I especially have enjoyed the ones that include meal-prepping ahead of time for week-day lunches. Thanks for providing these meal plans! I used the Sep 10 to Sep 17 meal plan for the first time and it was great! I felt well fed and was easily able to eat within my calorie goal. The hubby loved your recipes as well :). 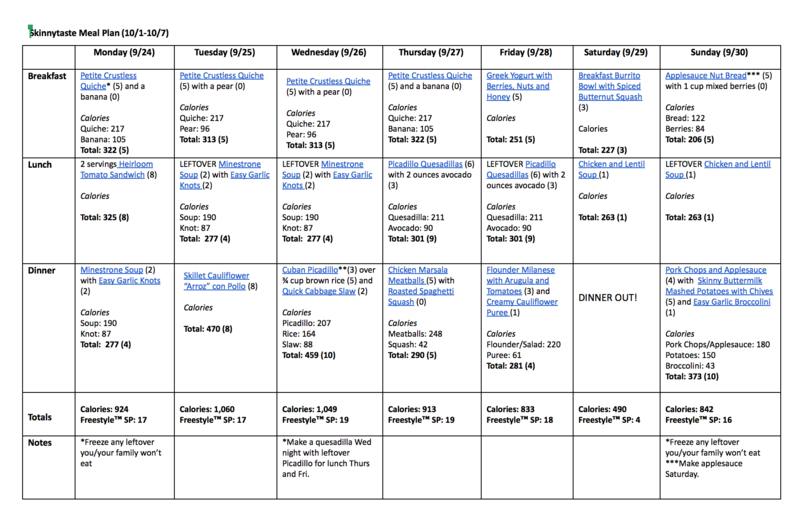 I’m excited to follow this week’s meal plan :). These are fantastic!! Please continue to put them together!! I have been using these for a few weeks now. I am studying. working, and going to the gym so these make life easy. It’s one less thing I have to think about. I currently have the minestrone soup in the instant pot and have already made the applesauce and garlic knots. I have a run scheduled after work so I am cooking ahead of time. Sometimes we run into too many leftovers since there are only two of us but generally speaking this keeps both he and I healthy and on track. Thank you. I check your website ALL the time and love these meal plans! Thanks for what you do. These meal plans are a lifesaver! I’ve been trying to do better with healthy and low calorie eating and I don’t know if I would be doing as well without these. I hope you continue to post! I love your meal plans and every recipe I’ve tried has been stellar. What I really enjoy is that you show all the food you can eat during the day and still have ‘room’ for the extras. A lot of great ideas! Thank you so much! Your menus are so helpful! I love your menus. I wish you would come out with a SkinnyTaste app that would allow me to uncheck recipes I wasn’t going to make during the week and then the app would automatically revise the shopping list based on that change. I know this is something I can do myself, but it would be a such a time saver. Have you thought about this? It’s a subscriber service I would pay for. Love these weekly meal plans!!! Easy to adapt and my husband as well as my 4yo and 2yo love the meals. Except for the last two weeks (we were away) I have been using the meal plans every week. I have lost inches with this in combo with my new gym routine. My husband, who is very picky and yet is a WW lifetimer really likes the meals he’s tried. Please keep them coming! I cannot print using the “click to print” option. Love love love these meal plans! They have literally saved my life as it has gotten so busy lately! The 0 point Chilli from last week is going to be a new family favorite! For the second night we served it over baked potatoes – so yummy! Please keep posting! Thanks for posting the meal plan. It really helps me have a vision for the week and especially with the grocery list, it makes everything easier. Please continue to share this, it’s great! I’ve been using these menus for months, and I love them! I have a big family, so I use AnyList to import the recipes and adjust the number of servings, then I use Walmart grocery pickup to save time on the shopping. Today I did a price comparison between your menu and the eMeals Budget-Friendly Plan, and I’m spending about the same on groceries with your plan as I would be if I was using theirs, so not only are you saving me time and helping my family eat healthier, you’re saving me money as well! Thank you!